On 9th October, Pat and I were taking one of our regular walks at Culkein Drumbeg. Turning over loose stones at the top of a retaining wall near the pier (NC109338), as you do, I came across an odd-looking ‘worm’. It was over an inch long when extended, but highly contractile. It was unsegmented, shiny and dark, without any noticeable stripes or pattern, and proved, on closer inspection, to have a couple of small eyes at the front end. David Haines kindly photographed it. Its appearance rang a distant bell and I identified it, via the internet, in an article by Hugh Jones on British land flatworms (British Wildlife, February 2005). Much of the recent interest in this group has concentrated on an invasive alien species which originated in New Zealand, but our find is a native species, Microplana terrestris. It is widespread in the British Isles, but there appear to be only six records from Highlands, one near Inverness, two in Skye, and, curiously, three from Assynt (NC03, 13 and 22). The author of the article is the son of Leicestershire naturalists I knew well; I may perhaps have sent him some specimens a while ago. Microplana terrestris is a scavenger, feeding on dead slugs and earthworms. Its New Zealand relative, Arthurdendylus triangulatus, is much larger, up to eight inches long, flattened, and dark brown with a paler spotted margin. 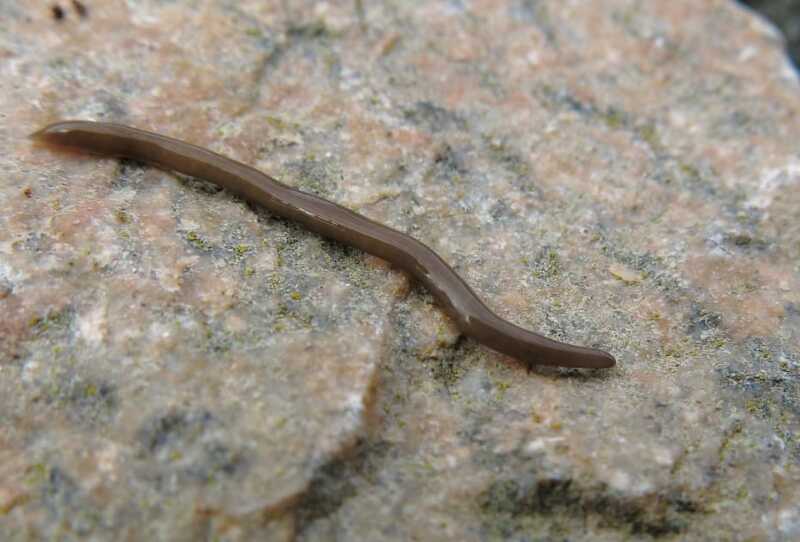 It predates deep-burrowing earthworms and is regarded as a potentially serious pest. It has been recorded in Assynt, though not recently. Please keep your eyes open, and let me see any possible candidates.